In this Tuesday’s “Science Times” section of the New York Times, freelance science writer Jim Robbins explains the push-pull between the lives of Yellowstone’s wolf packs (and the scientists who study them) and the needs and requirements of hunters and ranchers in the three surrounding states. Since 2011 Montana and Idaho have been conducting managed wolf hunts, but in Wyoming a U.S. Court of Appeals has only this March approved a wolf-hunting plan that is deemed not to endanger the survival of the species in that state. All the controversy about wolves stems from the 1995 and ’96 introduction of gray wolves (Canis lupus irremotus) into the park (and also into Idaho) from Alberta and British Columbia, Canada. Their population soared within a few years to around 150 wolves in the Greater Yellowstone Ecosystem, and scientists like Dr. Douglas Smith found, as quoted by Robbins, that “Yellowstone is the best place in the world to view wolves”—and to study them. This is especially true because the Yellowstone wolves do not fear the thousands of eager visitors who flock there—and incidentally add money to the regional economy. The wolves are thus quite readily visible. In the years after the introduction of wolves, neighboring ranchers were understandably distressed. Some of their cattle, sheep, and even dogs were killed; before wolf hunting was authorized some ranchers were reimbursed by nonprofit organizations for their losses. It is hoped that protection within the park, combined with limited hunting outside its borders, will provide the needed balance and keep the population of Yellowstone’s wolves to approximately one hundred, as has happened in the last few years. For some earlier blog posts about wolves here at YellowstoneTreasures.com, just enter “wolves” in the search bar. 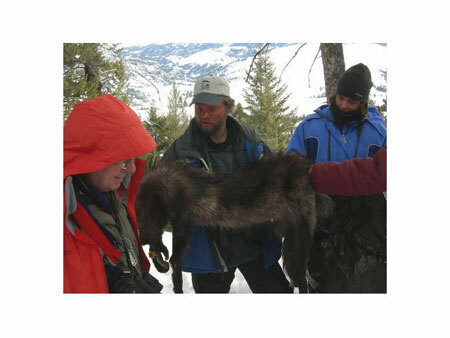 Photo is of Yellowstone Forever Institute instructor Brad Bulin showing a wolf pelt, winter 2006. Photo by Janet Chapple. Grizzly bears have been in the news in recent years. First, because human-bear conflicts have been more numerous, including a total of six deaths of people since 2010. Managing these conflicts and the bear predation on cattle means about twenty grizzlies are intentionally killed or removed to zoos per year (see this database if you are interested). In 2016 the news is that the U.S. Fish and Wildlife Service is proposing to take them off the Endangered Species list by the end of the year. 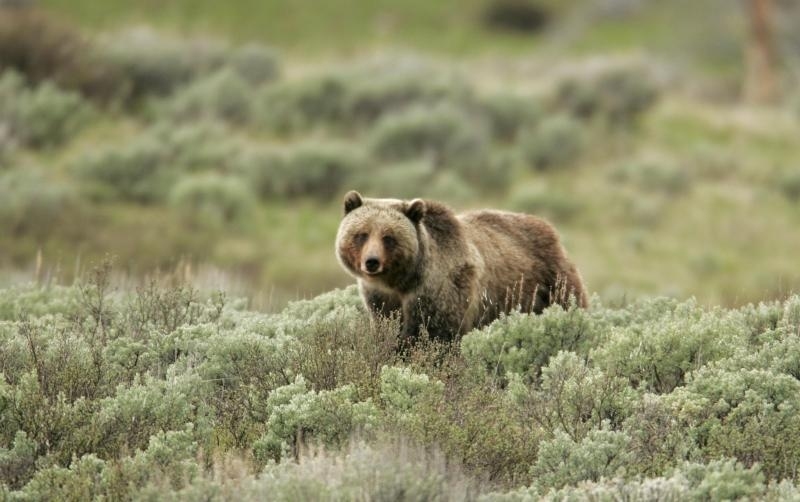 The National Park Service put together an informative page about the history of efforts to help the Yellowstone-area grizzly recover, including listing it and delisting it, plus explaining how to minimize encounters with bears and ensure your safety if you do accidentally come close to one. You can find the article here: “Grizzly Bears and the Endangered Species Act.” The most recent delisting was in 2007, but a court ruling overturned that and put them back on the threatened species list in 2009. Hike in groups of three or more people. Make noise in areas with poor visibility. Don’t run during encounters with bears. The grizzly bear population has made a remarkable recovery, to about 700 individuals in the Greater Yellowstone Ecosystem. So why is delisting controversial? Some are worried about plans for hunting in the surrounding states of Idaho, Montana, and Wyoming. For a March 20, 2016, article that quotes the state governors on the subject, see “US seeks end to Yellowstone grizzly protections” on the Explore Big Sky website. Do you have an opinion on this subject? Isn’t this photo beautiful? Write your informed comment below. Photo by Jim Peaco for the National Park Service, June 2005. In case the expression “charismatic megafauna” is not in your everyday vocabulary—it refers to the big wild animals that attract many people to Yellowstone. Late summer is a good time to take stock of what lives in the park, so I’ve dug around a bit and found some recent head counts for the biggest and most interesting wild animals. Curiously, the bison—that iconic beast that was nearly wiped out by hide-hunters by the beginning of the 1900s and again slaughtered by the hundreds in recent years for different reasons—in late 2013 probably has more hooves-on-the-ground than the elk. This in spite of elk numbers being up around the high 30,000s when I began paying attention (in 1995). This year’s count of bison is around 4,600, while elk are estimated at about 4,000. Grizzlies in the Greater Yellowstone area are estimated at 718 by the U.S. Fish and Wildlife Service, while in the same area wolves may number about 500, but with only about 80 in the park proper. A large factor in the present small number of wolves has been their delisting and subsequent hunting in 2012-13: 203 killed in Idaho, 179 in Montana, and 73 in Wyoming (which had a shorter hunting season). You’ll find related posts about elk and wolves in my June 7 and June 13 posts this past summer. Heading to Yellowstone myself in a few days [June 2013], I was very interested to learn that blaming the wolves for the huge decrease in elk numbers in Yellowstone is a big over-simplification. The numbers are unquestionably way down since I began taking notice in the mid 1990s. When I was researching for Yellowstone Treasures’ first edition (2002), I found that about 35,000 elk were summering in the park. The new fourth edition (August, 2013) will say that on the order of 4,000 elk can be found on the northern Yellowstone range, and there are a few more in the rest of the park. This is a reduction of more than 80 percent. A majority of the park’s wolf packs since reintroduction in 1995 have primarily preyed on elk. Thus, it has been easy to assume that wolves are to blame for this huge reduction in numbers. But a recent article in the latest issue of the journal Ecology reveals that the situation is much more complicated. Migratory elk are struggling, while their resident counterparts thrive in the foothills, recent studies have found. The 4,500-member Clarks Fork elk herd, which migrates between the Absaroka Mountains and the upper Lamar River area, finds less forage because of extended drought. In contrast, another researcher found that those elk living northwest of Cody, WY who do not migrate produce more calves, and more of them survive. They stay in the area because they find irrigated croplands. In addition, in settled areas many preying wolves and bears are removed by hunters and ranchers. Grizzly bears and poor summer forage conditions caused by several years of drought have a bigger effect on elk health than do wolves, the researchers concluded. I learned today from the Greater Yellowstone Coalition newsletter that 75 to 80 wolves now live in Yellowstone Park. This is less than half the number of wolves that lived in the park at the peak a few years ago. The current lower number explains why wolf sightings are down, especially in the Lamar Valley, which used to be the place to see wolves. However, fans of Yellowstone’s wolves are hoping to learn that a good number of pups were born this April. It’s still too early to know that for sure. The full article is at:http://www.greateryellowstone.org/issues/wildlife/Feature.php?id=38. I really must pass this on and keep quoting it in the future, because it’s an article by a highly respected Bozeman writer, who has done a convincing study about the effect of gray wolves on the elk population around Yellowstone and beyond. There has been a lot of waffling about whether or not to blame the last few years’ shrinkage of the Greater Yellowstone elk herd on preying wolves. This looks at the issue from the point of view of hunting outfitters. This is the time when wolves are awaiting the birth of pups, which occurs in Yellowstone during April. Right now the park seems to be catching up on a low total snowfall so far this winter, which may make for a late (and very short) spring. Idaho rivals Alaska for the most aggressive policies for hunting wolves. It allows trapping and aerial gunning, and its ten-month wolf season runs until June, claiming 353 wolves so far. Montana hunters have killed 166 this season, with an overall quota set at 220. However, the Montana Fish, Wildlife and Parks Commission decided not to extend the 2011-2012 wolf hunt in one Montana area, the Bitterroot Valley. A federal appeals court on Wednesday rejected a lawsuit from conservation groups that want to block wolf hunts that have killed more than 500 of the predators across the Northern Rockies in recent months. The ruling from a three-judge panel of the 9th U.S. Circuit Court of Appeals said Congress had the right to intervene when it stripped protections from wolves last spring. The U.S. Fish and Wildlife Service is praising Idaho and Montana for successful management of gray wolves. In its 2011 Annual Report for the Northern Rocky Mountain Wolf Population, the Service now estimates the region’s wolf population at 1774 animals and 109 breeding pairs. U.S. Fish and Wildlife Service Mountain-Prairie Regional Director Steve Guertin said, ‘these population estimates indicate the credible and professional job Montana and Idaho have done in the first year after they have assumed full management responsibilities.’ He said the states’ management plans will maintain a healthy wolf population at or above the agency’s recovery goals. It is certainly not news to me that the great decline in elk numbers in Yellowstone in the twenty-first century is at least partly due to the reintroduction of wolves, but the next sentence was very interesting to me, proving that there must be other factors contributing to the decline in Yellowstone’s elk population.